Stars And Garters: Friday Night Fights: Thunder - Round 6: Feeling Cavalier! Friday Night Fights: Thunder - Round 6: Feeling Cavalier! Tonight's round of Friday Night Fights: Thunder features a special Bronze Age battle of the sexes from Wonder Woman#212, written by Len Wein and illustrated by Curt Swan and Tex Blaisdell. 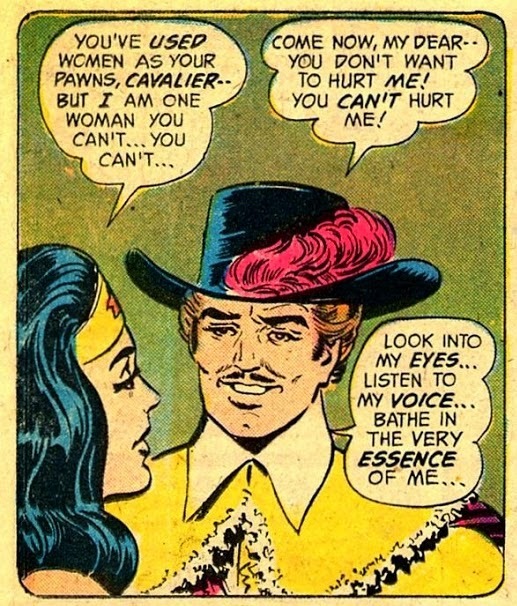 This story pits Diana against The Cavalier, a villian with the power to control women. 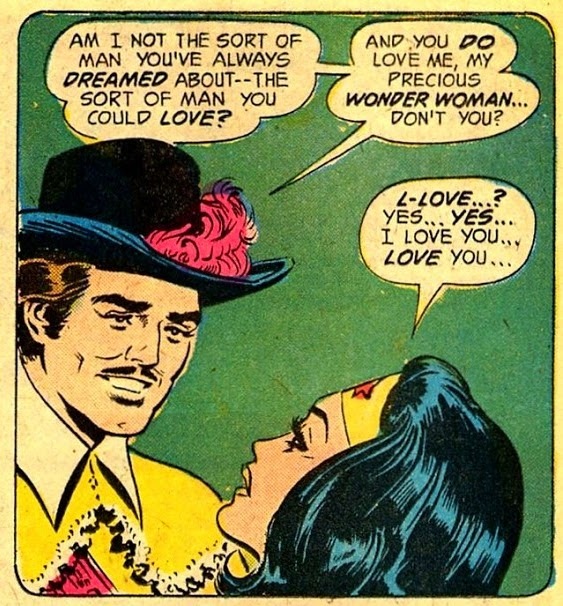 Here, this plume-hatted would-be PUA tries to sway thew Amazing Amazon. Let's see how that works out for him, shall we? As you can see here? Not very well. For tonight's fight music I've cavalierly chosen this tune by Against Me. For more foppish falling-outs, click here. And don't forget to vote! Aw... how can you turn down a man who is secure enough to wear lace? Friday Night Fights : Ghost - Round 8 - Firefall! Friday Night Fights: Ghost - Round 8: The 3-Way!